Grasscycling is simply leaving your clippings on the lawn. It is an easy way to create a healthy lawn and saves you time, money and effort. Leaving lawn clippings on the lawn recycles nitrogen back into the soil, helps hold water and keeps weeds down. When grasscycling, cut off the top third of the grass and leave it on your lawn. 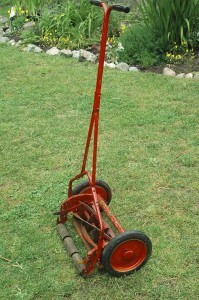 This is done by modifying your existing mower, using a mulching mower or using a hand push reel mower. The clipped grass will break down, adding nutrients and water to the lawn. 25% more nutrients are added to your lawn by grasscycling. The quietest, most inexpensive, lightest and emission-free choice is a push mower! They work great! Once you try one you’ll see how excessive a gas mower is for cutting your tender blades of grass. Mulching mowers are also great for grasscycling. They can be electric, battery operated or gas powered. Fertilize only if needed, so test your soil to find out what nutrients it may need. Over-fertilizing only makes the grass grow faster, so use compost! Mow high and mow more often. Watering is best done in the early morning. Most lawns need only 2.5cm of water/week. Natural Lawn Care – What is it? Natural lawn care is all about creating a healthy lawn that is easy on the environment. Lawns and streams are connected. If you use too many chemicals or too much water, chemicals are washed into storm drains and right into the streams (without being filtered or cleaned). Chemical overload harms fish populations along with other aquatic life. You can have a healthy lawn and help sustain our environment too! For more information visit EarthWise Society’s website.